Here we go again, back on the road: this time down to Hungerford, new territory for the Poppies and the PRATS. A 10:00am start from Maison du Fuggles, but not before Parker and Citra got out of the Pratsmobile to admire the new feature on Fuggles auto, an enormous dent in the side as a result of some bloke deciding not to stop when entering a roundabout. The exchange of dialogue between Parker and Citra, was sounding a bit like Dudley Moore and Michael Caine having a bit of a chinwag. “Nice dent that “said Citra, he continued, “If I was in the market for a dent, that is the type of dent I would aspire to possess”. “It’s the striations that do it for me” chirped up Parker. “Nail, head, hit, on the” replied Citra. Parker added “Any bloke with a smidgeon of ambition would yearn for a dent like that”. “I’m in a state of overwhelming yearnment right now” said Citra “Now let’s get on the bloody road pronto Tonto”. Pharp was gathered in at around 10:30am and at around midday we arrived at a CAMRA national pub of the year finalist the Five Bells in Wickham. A lovely thatched roof pub, looking every bit quintessentially English. Once inside we were greeted by a the IVIF, the Inbred Village Idiots Faction, Dave Tailby and co playing a game of cards, Happy Families by the look of it. A nice looking pub, low ceiling with 100’s of used pump clips adorning a considerably large area of the ceiling. It was a single long room, looks very much like several rooms knocked in to one. A nice long row of hand pumps along the bar, with 3 serving the house brews from the Innformal brewery at the back of the pub. Inn Deep chocolate stout, SanFrinnsicso west coast IPA and a Red ale, also on the bar was 360 Degrees brewery 360 Pale ale, Red Squirrel’s Scottish Ale, Windsor & Eton’s Guardsman, Hop Stuff’s Arsenal pale ale, plus another ale called Maltz, we’ve forgotten the name of the brewer. Fuggles and Citra started with the 360 pale ale, very nice and tasty, it started with a good head but disappeared very quickly. 3.9% pleasant enough but not a show stopper. Pharp went for INNformal Red ale, a good creamy head with a rich colour, the head once again fell away after a few sups, but it didn’t affect the taste. Parker had the Red Squirrel Scottish ale, a nice looking chestnut red, with roasted malt flavour coming in at 4.3%. Next up Pharp and surprisingly Citra went for the chocolate stout, a rather robust 5.0% dark chocolate flavoured ale. A creamy head clingling on loosely to the glass, packed with flavour lingering on the palate well after the gulp. Fuggles went for the Guardsman, quite nice tasty and tangy, coppered colour ale coming in at 4.2% a loose head generally hanging on until the end. Our third and final pint here, Pharp went for another strong ale the Maltz, sadly we didn’t note the brewer, but this was a deep brown ale coming at 4.7%, Pharp was getting g quite talkative with all the strong ales. Fuggles and Citra went for Hop Stuff’s Arsenal Pale ale; looking at it you’d think this was a wheat beer, slightly hazy yellow/orange ale, quite bitter and citrusy, nice and refreshing at 3.8%. Parker went for a milky coffee, very nice. 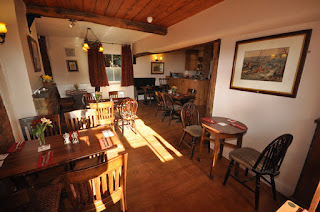 That was it for this lovely pub, quite a few dining, including the IVIF, the prices seemed quite high with a burger and chips at around £15.00. The food did look very nice and plentiful. We now moved onto the next pub just a few miles up the road to the Tally Ho in Hungerford Newton. The car park was almost full just once space thankfully. A full car park generally means a full pub and so it was, it’s good to see a Community pub doing well, the Tally Ho is owned by around 160 of the villagers, helping to keep the village local going. This former Wadworths pub was doomed to become flats. But the villagers rallied round and bought the place plus further investments to install the bar and kitchen. Mostly staffed by volunteers the pub is now quite busy with diners and drinkers. 4 ales on hand-pump, local brews included Ramsbury Gold, West Berkshire’s Good Old Boy, Binghams Twyford Tipple and from slightly further away Hook Norton’s Hooky. Fuggles started with Ramsbury Gold, refreshing 4.5% golden ale, quite pleasant easy drinking served in excellent condition, Pharp and Citra went for West Berkshire Good Old Boy, a fairly standard brown bitter at 4.0%, in decent nick, malty taste but not really setting the world on fire. Next up for us all was Binghams Twyford Tipple, another easy drinking ale at just 3.7%, malty with some citrus coming through late on, very pleasant and in good condition. That was it for this delightful pub and very friendly staff. The toilets were so smart you would expect to find them in an upper class hotel. All in all a good experience and we look forward to coming back here in the future. It was time to move on to the ground just 10 minutes away quite close to Hungerford town centre. The game, well like most games the PRATS have travelled away to watch this season the result was once again disappointing. Our away results this season is bordering on relegation form, it’s enough to turn a man to drink. We huffed and puffed, but were wasteful and at times disorganised. Unlike the Crusaders when even down to 10 men for most of the second half never gave up running and chasing giving us very little time on the ball. We could have come away with a decent draw but in the end an unfortunate handball resulting in a well taken penalty determined where the points would be going. Hungerford will be in and around the play offs come the end of the season. Best of luck to them, but if they don’t get promoted the PRATS will be looking forward to coming down this way again next season. Time to go home, Parker had to be home early this evening so it was straight back to Kettering, sadly missing out on going to the Mason’s Arms in Headington, Oxford. Never mind we are travelling down to Chippenham in two weeks, another tough game, but it gives us an opportunity to get to the Masons. Next up is a rather short trip to Rothwell in the Northants Senior cup next Tuesday, we take on Rowell Corinthians, can we get a win?